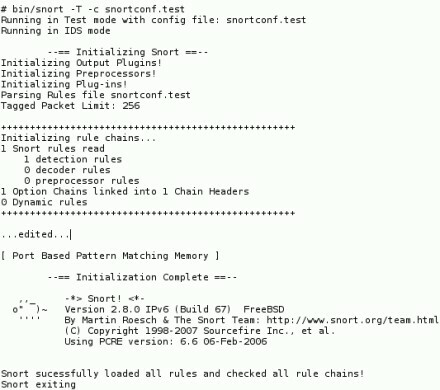 Snort 2.8.0 comes with new features long desired for the open source intrusion detection system, including IPv6, port lists and packet performance monitoring. Learn about the new IPv6 and port lists that VARs and systems integrators can use to optimize their use of the IDS in this latest edition of the Snort Report. Snort 2.8.0 was recently published with several features long desired by Snort veterans. These new features include IPv6, port lists, packet performance monitoring and control of actions enabled by preprocessor or decoder events. This edition of the Snort Report provides details on IPv6 and port lists that VARs and systems integrators can use to optimize their use of the open source intrusion detection system. Begin by downloading Snort 2.8.0. The system I use here runs FreeBSD 6.x. Next, review the RELEASE.NOTES to find new features and see if any special instructions should be followed. On my system the release notes (once extracted) are located in /usr/local/src/snort-2.8.0/RELEASE.NOTES. It's also a good idea to look at the INSTALL document at /usr/local/src/snort-2.8.0/doc/INSTALL. After looking at the documentation, install Snort. Notice the new switch to enable IPv6 support. I suggest making two copies of the snort.conf file. The first can be modified for use by Snort, while the second can serve as a reference point. After installation, execute the Snort binary with the -V flag. If you forgot to enable IPv6, you'll see the following. If you don't see mention of IPv6 and you want to inspect IPv6 traffic, re-run the installation process. With that file ready, test the installation in IDS mode, activated by the -c switch. Now I can run Snort against a live interface, which I'll ping from another host. Tell Snort to send alerts to the console. Once this alert fires we kill Snort with ctrl-c. The most interesting aspect of this traffic for me is seeing the IPv6 protocols. Compare the previous listing with the output from the same test run by Snort 2.7.0.1. Snort versions prior to 2.8.0 recognize far fewer protocols. Here fe80::20c:29ff:fe00:c6c2 is the link local address of the FreeBSD system that will be pinging the listening interface of the Snort sensor. (You don't want your listening interface to be Internet-reachable; it should be completely passive. This is only a test.) The other IPv6 address is fe80::20c:29ff:fe60:232a; it's the link local IPv6 address of the Snort sensor. The first system pings the second to trigger a Snort alert. Test them with Netcat and Host. Keep this in mind when writing rules. One of the most exciting aspects of Snort 2.8.0 is the introduction of support for port lists. Older versions of Snort only accepted individual ports or port ranges when specifying TCP or UDP ports in rules. For example, the README.variables document shipped with Snort 2.8.0 offers the following, which may appear in your snort.conf configuration file. I've added a line number to each for reference purposes; you should never have line numbers in a real snort.conf file. The first item to notice is the use of "portvar" in lines 1 and 4-6 and "var" in lines 2 and 3. Snort 2.8.0 users should use portvar from now on, as the use of var will be deprecated in a future version. If you decide to use var, observe that the entire variable name ("EXAMPLE2_PORT" or "PORT_EXAMPLE2") must begin with "PORT_" or end with "_PORT". I recommend using portvar. Line 1 sets EXAMPLE1 to be port 80. Line 2 sets the range 80-90, inclusive, to EXAMPLE2_PORT. Line 3 sets PORT_EXAMPLE2 to port 1. Line 4 sets EXAMPLE3 to any port. Line 5 sets EXAMPLE4 to any port except those in the range 70-90, inclusive. Line 6 sets EXAMPLE5 to port 80, 91-95 inclusive, and 100-200 inclusive. README.variables offers the following sample rules, again annotated with numbers for reference only. Rule 1 alerts on TCP traffic from any IP, port 80 to any IP, port 80-90 inclusive. Rule 2 alerts on TCP traffic from any IP, port 1 to any IP, any port. Rule 3 alerts on TCP traffic from any IP, port 90, to any IP, ports 100-1000 inclusive and ports 9999-20000, inclusive. That doesn't look right. Why did the first alert fire? You don't want to see traffic to port 8000 TCP, but there was an alert. The second alert fired because the RST ACK was sent to port 50970 TCP, which is not in the port variable list. Let's try another angle in a new snort.conf. Again use Netcat to generate traffic. This is the desired behavior. Snort ignored the SYN packet to port 8000 TCP, but it fired on the return traffic. I discussed this activity in IRC with Snort creator Marty Roesch. He asked me to report it to Sourcefire, since it might be a logic issue. This edition of the Snort Report looked at Snort 2.8.0 with IPv6 and port lists. In a future edition I will introduce other features found in the latest Snort release.